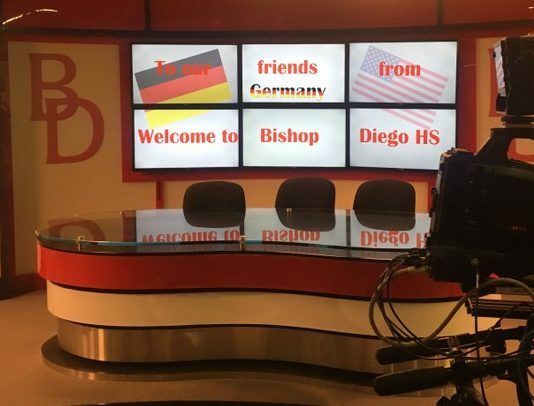 Today was our first day at Bishop Diego High School! We were really excited and although a bit jetlagged we couldn’t wait to begin the day! When we arrived yesterday we really couldn’t soak up the surrounding, we were just too tired and when we stepped outside of the house we could see the beauty that surrounded us: the beautiful mountains, palm trees, those typicial American houses with their huge garages and porches- all so pretty and the best thing was the weather. The sun was bright and shining and we felt like a million bucks (not much is needed to make us Germans happy -haha). So when we got to the school we were greeted by lovely Mrs Callow who made us very welcome and then we got to meet our partner in crime Mrs McNay who made all of this possible! She introduced us to the head of school Mrs Regan who was so happy to see us and we thanked her for having us and allowing us to be part of Bishop Diego High! Mrs McNay showed us the school grounds and we couldn’t believe our eyes how gorgeous everthing looked-from the peace garden to the media rooms (more on that tomorrow) or the well equipped gym! We met other teachers as we peaked into classrooms and lessons and everybody was so welcoming and excited to meet us that it felt like coming home. Now we really felt like a million bucks. We couldn’t have asked for more. We spent the rest of the day with students and shadowed them throughout the day which was really fun. Not only could we watch we actually contributed- Marlene for example was in a film that the students produced for an assignment. It’s all very different here. For example there are Mac computers at the teachers‘ desks, there is a big TV screen so that teachers can show their assignments or videos and use the Internet to show something to students. The most striking was how natural everybody used the devices /technology. Here it’s daily business in Germany it’s the opposite. Although we do have classes that operate that way it’s not thoughout the day, but we can’t complain. We like our chalkboards. Our school day ended in prayer. Everybody got up from their seats and a prayer was given via the speaker by the head of school. In Germany we pray at the beginning of our school day-either it’s the school’s prayer or individual ones students wrote themselves. So every class does it their own way and it’s us who are reading it out loud. So that was a different experience as well. The school day finished early and we were introduced to all of the teachers and everybody was happy to meet and speak to us. They told us that we can come to their classes any time and ask all the questions we could possibly have. That was really cool! We realized how close everybody is. Students and teachers have really greta relationships, teachers know everybody’s name (there are only 250 students however) and teachers come in early so that students can ask questions or have problems with assignments which is really nice- it’s like having a private tutor who helps you out if you are stuck. So that’s also something different from our school system. Anyways, it’s become clear to us that Bishop Diego is a family and after DAY 1 we definitely want to be part of that family, too! PS: we don’t want to maky you any more jealous than you probably are already, but after a quick swim in the pool we went to a Baseball game- our team obviously won!